It’s over three years since Wellbeing Tibetan Medical Camps started in Kerala. Over the last three years, the number of participants has increased from 1 to over 2000. Every month for 3-4 days, the camp spreads the essence of wellbeing to the 60 odd new participants and 150 regular participants. Every participant is accompanied by two or three people to help them, or out of curiosity. During the 42nd Wellbeing camp organised by Friends of Tibet in association with Men-Tsee-Khang, Tibetan Medical and Astrological Institute of HH the Dalai Lama, we saw siblings of a participant accompanying her to see the doctor. To them the doctor who has brought a positive change in their sister's health is an angel. In the middle of a crowded city, polluted by development, the camp venue was heaven on earth. Lush green landscaped garden, chairs which hold memories of many participants, friendly environs added wings to the message of wellbeing. It was high time that people from other parts of the state benefit hosting this age old tradition of medication, Tibetan Medicine. 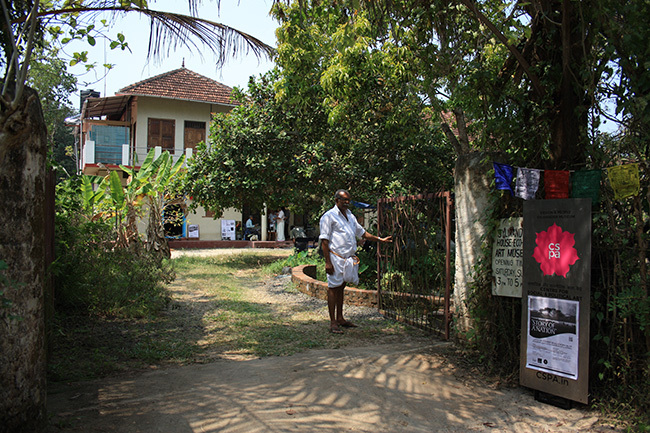 Moving the camp from the current location, we had to search for a place which is more eco-friendly; Alappuzha, popular as 'Venice of the East', was chosen as the destination. 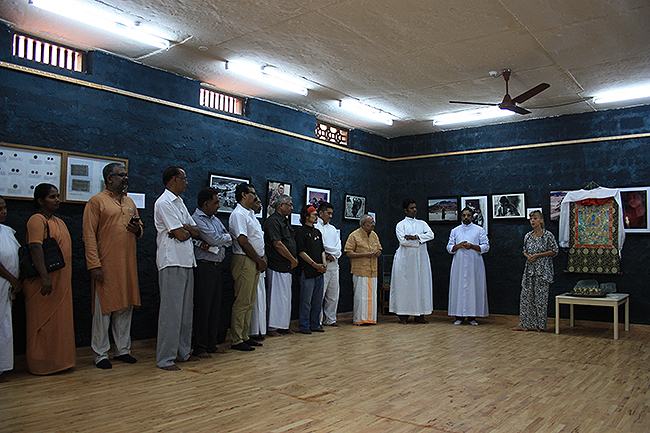 Centre for Social and Political Art (CSPA), located at Sylviander House, near to Chettikad Beach, Alappuzha provided the right venue we were looking for. Alexandar Devasia and Sylvie Bantle, who had benefitted from the essence of Wellbeing Camps, were kind enough to play the perfect hosts. Built using traditional architectural methods, each wood had a story, each flower a poem. Once we made the decision in December 2014, we wanted the inaugural camp to coincide with the first exhibition of Centre for Social and Political Art (CSPA). During one of our regular afternoon meetings, we were going through the Tibetan Artefacts and discussed about the exhibition that was planned 9 years earlier – "Story of A Nation"! Scripted by Jane Perkins and Lhasang Tsering, it told the story of the three phases of Tibetan History – Independent, Occupied and in Exile. 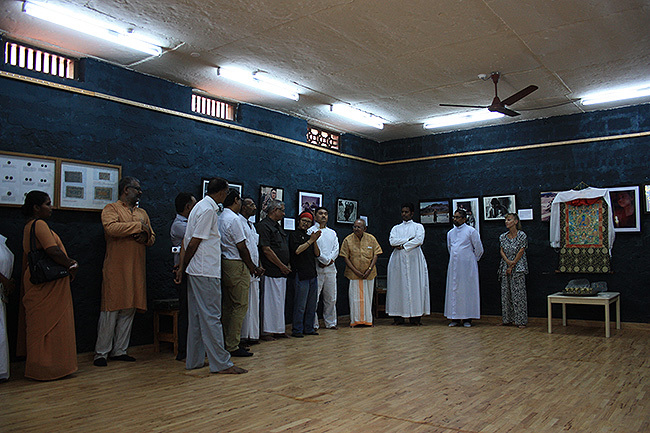 Taking into consideration the limitations in terms of space and logistics, it was decided that a smaller version of Story of A Nation be exhibited. Initially we were doubtful if we could accomplish the tasks within time, and decided to give a try till January and see if we could go ahead as planned. Working out on a tight schedule, a handful of resources, and even tighter purse, we had to plan each minute details of the exhibition, creating spreadsheets, digital miniatures, guidelines for the vendors, taking measurements. Deadlines were decided and sticking to them was a mammoth task. In the end, Story of a Nation was a great experience. 1) Sylvie Bantle of Sylviander House and Co-founder of Centre for Social & Political Art (CSPA) gives Welcome Speech 2) Sethu Das, Founder of Friends of Tibet introduces the event and welcomes chief guests 3) Tenzin Tsundue, Tibetan poet-activist speaks about the tragedy of Tibet 4) Eswar Anandan, Campaigner of Friends of Tibet speaks to the gathering; 5) Shri Alaxander Devasia of Sylviander House and Co-founder of Centre for Social & Political Art (CSPA) gives Vote of Thanks. Shri Sethu Das, Founder, Friends of Tibet said, "I am happy today, at last it has happened. Otherwise I was planning to frame each of these photographs, one every month, and hang them in my room; each photograph has a story to tell; the photographers have sacrificed a lot, undergone many pains to capture these masterpieces and they were kind enough to donate their works for the cause. So we need to do justice to them." The inaugural medical camp also saw the coming together of the Three Musketeers. Belonging to three corners of the country, they met because of their common interest: Tibet. Shri CA Kallianpur who has devoted over three decades of his life for the cause, hails from Mumbai. Shri Tenzin Tsundue, the famous poet and Tibet activist hails from Kollegal, Karnataka. Shri Sethu Das, from Kerala. Coming from three different cultural backgrounds, belonging to three different parts of the country, brought up in three different social strata, their friendship is now over 15 years old. Experience is the best teacher! No amount of library reading or article surfing would give such exhaustive knowledge and insight of the Tibetan Cause. Shri Kallianpur, taking care of the details, handled registrations; some of the participants benefitted listening to his vast knowledge on history of India, China and Tibet. Initially Shri Tenzin Tsundue was expected only for a day, but the green locales and closeness to nature made him extend his stay, benefitting many participants to know more about this famous Tibetan Activist and Poet. Some of them even managed to get an autographed copy of his book, "Kora". It was an experience to see the three bond, tease each other and talk about the various campaigns they did together in the last 15 years. It is a traditional Tibetan belief that the Chu-Mik Gu-Dril (Nine Braided 'Water Eyes') has the power to protect you from harm, acting as a weapon against evil and demonic forces. In 1988, led by the late Yulo Dawa Tsering (Ven Yulo Rinpoche), Tibetan political prisoners started wearing wristbands with the nine 'eyes' for protection from the 'evil' Chinese – seen by Tibetans as not only their oppressors but the enemy of the Dharma. 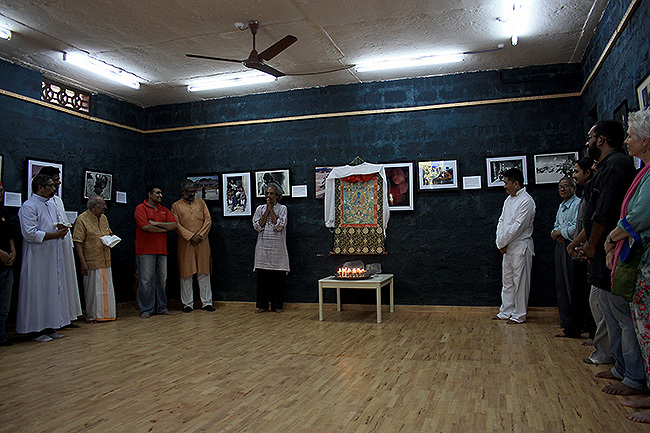 It was also a silent protest against Chinese atrocities in Tibet and a mark of solidarity among themselves. Unaware of this symbol, prison guards also started wearing these bands. Many participants asked for the Rangzen band too. Popularly known as the 'Rangzen' or 'Freedom Band' – this symbol of resistance against oppression and their undying struggle for freedom – is worn the world over by Tibetans and their supporters. Wearing a 'Rangzen Band' is one way of showing that you know and that you care about the Tibetan people's struggle for independence. 'Story of a Nation' is a tribute to the pain undergone, the sacrifice and the effort taken to capture the real face of Tibet. 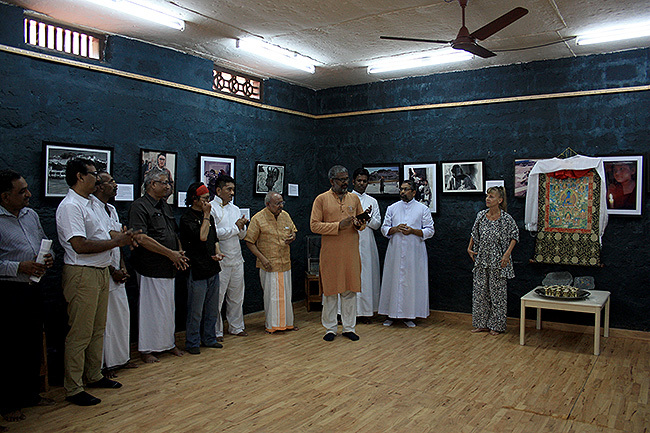 Thank you contributing photographers – Angel Lopez Soto (Spain), Angus McDonald (Australia), Brian Harris (Canada), Diane Barker (UK), Jaqueline Meier (Switzerland), on (USA), Prabir Purkayastha (India), Prabuddha Dasgupta (India), Sonam Zoksang (USA), Suresh Natarajan (India), Vijay Kranti (India), Vikas Khot (India), T Wachs (USA), William Chapman (USA). Looking back 42nd Wellbeing camp was one of the most memorable camps I experienced and I would cherish for time to come! 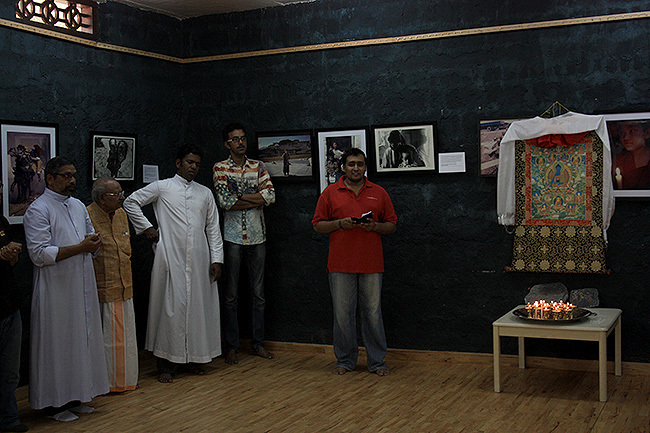 20 Lamps for CSPA: 20 Tibet Supporters and Wellwishers of Friends of Tibet from Kerala state gathered at Centre for Social & Political Art (CSPA), Alappuzha on February 11, 2015 and lighted 20 traditional Tibetan butter lamps which also marked the beginning of CSPA activities at Sylviander Land. 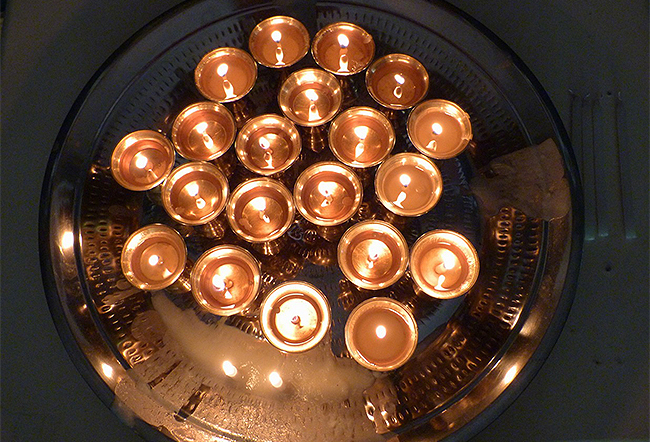 20 People who lighed butter lamps are: 1) Dr Shri Dorjee Rapten Neshar, Chief Medical Officer, Men-Tsee-Khang, Bangalore; 2) Shri Tenzin Tsundue, Tibetan Poet-Activist 3) Shri CJ Yesudasan, Political Cartoonist 4) Fr Shri Nelson 5) Fr Shri Rimson 6) Shri Ravi Palathinkal, Gandhian Activist; 7) Shri Viswambaran; 8) Shri Francis Kodankandath, Artist and Customs Official; 9) Shri Mathewkutty J Mattom, designer and photographer; 10) Dr Madhavachandran V, Director, Nagarjuna Ayurveda; 11) Shri TS Anandan; 12) Shri L Manjunath of Bhima Group 13) Shri Kailashnath of Bhima Group 14) Shri Rajan Menon, Retired Scientist, BARC; 15) Smt Victoria Sheldon, Friends of Tibet Volunteer from Canada; 16) Smt Sylvie Bantle, Co-founder, Centre for Social & Political Art (CSPA); 17) Shri Alexander Devasia, Co-founder, Centre for Social & Political Art (CSPA); 18) Shri Suku Dass, Friends of Tibet Campaigner 19) Shri Yeldtho Mathew, Friends of Tibet Campaigner 20) CA Kallianpur, National Coordinator, Friends of Tibet.